A soup has always been one of my favourite meals and my weakness. It being a typical weather where sunny uncle playing hide and seek in my part of the world, we get solace in slurping big bowls of delicious soups. This week it was all Peppers pepping us up in a form of Red Bell Pepper Soup and Creamy Green Pepper Soup. And they go to my dear buddy Pooja who is hosting two-in-one events JFI & VOV-Bell Peppers. Enjoy these blasts from the past. those are yummy soups, sia! lovely entries. Another one soup from your kitty that I am definitely going to try..thanks for sharing! Never heard of bell pepper soup . Sounds intersting and it looks so delicious. Must have really tastes good. These soups both look appetising but my personal favourite would be the green pepper soup. sia..this is sheer virtual torture and for this you will be penalized heavily!..how you can kill us with such beauty!..soups look lovely ...! 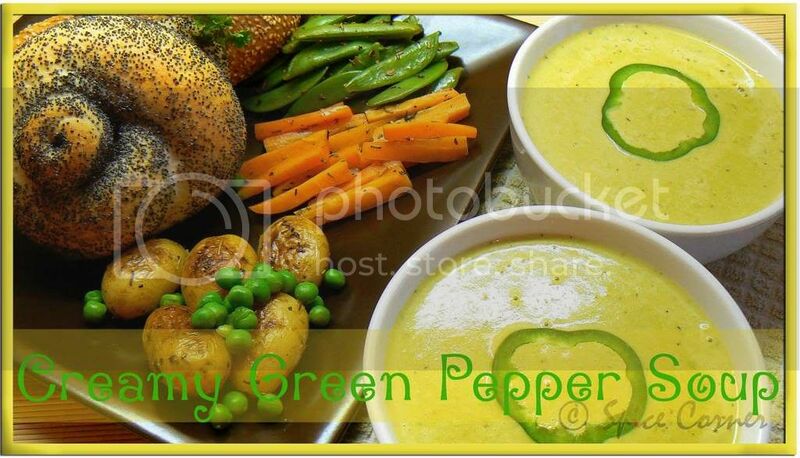 that green pepper soup looks fabulous and the roasted veggies too - those carrots and potatoes and peas...lovely! Spicy & colorful soup...looks fantastic sia. delcious soups!! !love the presenationa dn the photos!!! Looks lovely Sia. I've never heard f bell pepper soup. Must try it. 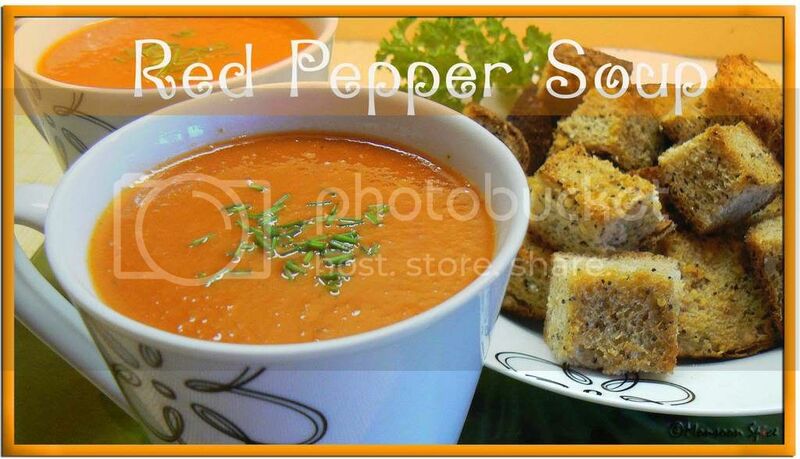 Red pepper soup s one of my favourites. These days i'm not able to cook so last time when I went to COSTCO I bought a 4 pack roasted redpepper soup. it soo delicious. Love the creamy green epepper soup. Hope your feeling better now. Lovely pictures Sia. Bell pepper soup is a long pending one, I have to try it out. wonderful soups, so many colors. I am looking for some light soup recipes just to get back in shape. i think i just found one. Lovely soups Sia....they look so refreshing! Sia - I just saw your soups on the round-up. I have book marked them and can't wait to try! Excellent presentation!